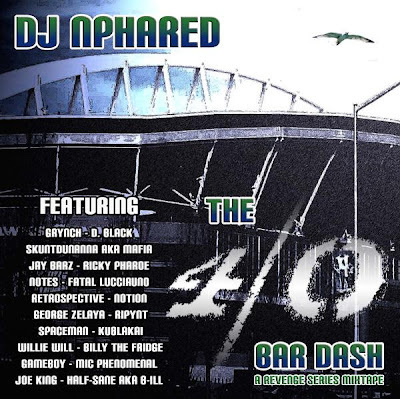 DJ Nphared just released the digital download version of his Revenge Series Mixtape, The 40 Bar Dash, featuring Grynch, D. Black, Skundunanna aka Mafia, Jay Barz, Ricky Pharoe, Notes, Fatal Lucciauno, Retrospective, Notion, George Zelaya, Ripynt, Spaceman, Kublakai, Willie Will, Billy The Fridge, Gameboy, Mic Phenomenal, Joe King, and Half-Sane aka B-Ill. So, beef up on your 40 Bar Dash and be on the lookout for Part 2 featuring "Grynch, D.Black, Cool Nutz, J.Pinder, GMK, Onry Ozzborn, Gatsby, Noshoe Strangz and more!!!" Click here to download The 40 Bar Dash.